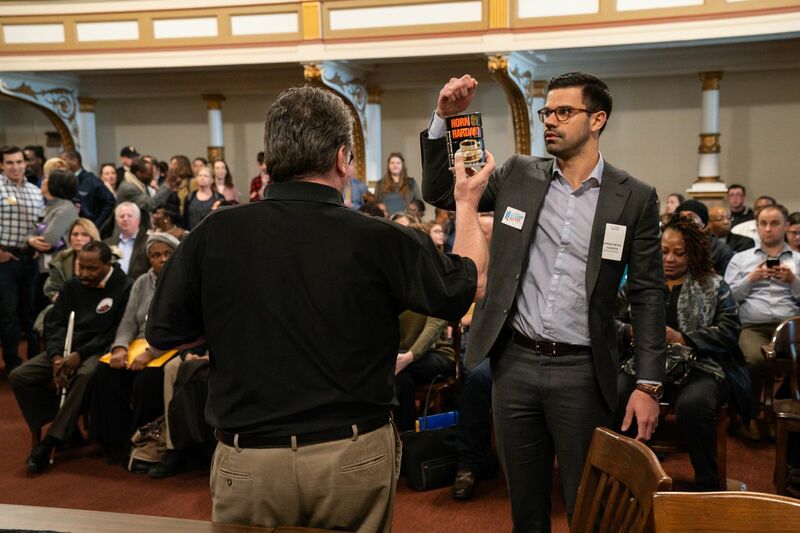 Adrian Rivera-Reyes draws the number one ballot position in the Democratic primary for Council at-large in room 676 of City Hall, in Philadelphia, Wednesday March 20, 2019. Holding the can is Kevin Kelly, acting supervisor of elections. An old-school Philadelphia practice doled out some newcomer luck, as a 26-year-old gay democratic socialist and the first transgender woman to run for City Council pulled the number 1 and number 2 ballot positions. Adrian Rivera Reyes wore his lucky socks — the ones that say “I got this” on the bottom — as he drew the first ballot position in a crowded field for City Council at-large. “I’m ecstatic. I’m getting all the texts and I’m just trying to process this,” Reyes, a cancer researcher and first-time candidate, said after the drawing Wednesday. “It’s going to be a big bonus for me." Reyes would be the first openly gay City Council member and its youngest if elected. In Pennsylvania, ballot position is assigned randomly through a lottery, and in Philadelphia, candidates gather for a political spectacle to pull numbers out of an old Horn & Hardart coffee can. The can itself has become something of a celebrity, with a Twitter account teasing the event like a municipal primary Selection Sunday. On Wednesday the “can of destiny” dished out hope and heartbreak to candidates, specifically for City Council at-large, where 34 Democrats and seven Republicans are vying for seven seats, the most candidates since 1983. Ballot position, research has shown, affects how voters pick candidates, especially in crowded fields when there isn’t a lot of information and in primaries where they can’t just default to their preferred party. Of course money, endorsements, and party support also matter. “There’s not a lot of resources in the campaigns to get out the information, and what happens is individuals are affected by other things like what comes across their eyes first," said Christopher Borick, a political science professor at Muhlenberg College. Deja Lynn Alvarez, a longtime public-health and LGBTQ activist, who is also the first transgender woman to run for City Council, pulled the number 2 spot for Council at-large. Deja Lynn Alvarez draws for a ballot position out of the coffee can in Room 676 of City Hall with the help of Kevin Kelly, acting supervisor of elections. “It’s kind of crazy when you think about it, that you pull a number out of a coffee can, in today’s day and age, and ... it can change things in such a positive way," Alvarez said. She said her phone had been ringing nonstop in the hour after the drawing. Especially in crowded races, many groups or individuals wait to back candidates until they see where they land on the ballot. Of the at-large Democratic incumbents, Councilwoman Helen Gym got the number 3 ballot position, Councilman Allan Domb picked “lucky number 13” — he kept a photo of his dog, who recently passed away, on his cell phone for good luck. Derek Green, who picked number 1 when he was first elected in 2015, picked number 28 this time around. Republican incumbent Al Taubenberger will have the number 1 position on the GOP ballot. Fellow Republican David Oh was less lucky, drawing the number 5 spot in a field of seven. Green thinks the high pick will bring a sense of urgency to his campaign. “Having a high number, it allows me to go back to people who keep saying, ‘You’re going to be OK, you’re going to win.’ This gives me the opportunity to get some more energy and get more people on board and focused on my campaign,” Green said. Councilman Derek Green draws for ballot position at City Hall with Kevin Kelly, acting supervisor of elections, at right. He said his high number -- 28th on the Democratic ballot -- would motivate him. Both Green and Domb said afterward they want to try to change the system, which would likely require an amendment to state election code. The ballot-drawing event always takes on a conflicting air, held in a stately sixth-floor City Hall courtroom but attended by a jittery crew of incumbents and challengers whose sharp intakes of breath, cheers, and groans at times sound more like a circus crowd watching a high-wire act. Candidates brought totems of luck or children to pick for them. Beth Finn, a candidate for Council at-large, who drew number 11, had practiced picking out of a Horn & Hardart can her staff ordered online. She carried around a little number 2 ball in her pocket for a week hoping it would bring good juju. Why number 2? “One seemed greedy,” she said. Erika Almiron asked her mother to come along “and bring all the rosaries.” She wound up with number 15. “Lucky quinceañera,” Almiron said after the drawing. Some picks were collectively celebrated or bemoaned. Applause and cheers followed Tracey Gordon, a former deputy city commissioner, picking number 1 in her bid to unseat longtime Register of Wills Ronald Donatucci. Willie Singletary, a former Traffic Court judge who served jail time for lying to federal investigators in a corruption probe, got the number 4 Democratic position for Council at-large, drawing groans from the crowd. Singletary is one of many candidates facing legal challenges to getting on the ballot. Justin DiBerardinis, who pulled the 31st spot on the Democratic at-large ballot, predicted some candidates were “playing the lottery,” hoping for a low number but planning to drop out of the race if that didn’t happen. Justin DiBerardinis draws number the 31 out of 34 ballot spots out of the coffee can at City Hall. For the less crowded races, picks weren’t as emotionally charged. Joe Lynch, an administrator at the Board of Elections who called up candidates for the draw, encouraged Democrat Jeanette Geter to pull a number even though her first spot on the Democratic primary ballot for City Council’s 4th District was already locked in. Councilman Curtis Jones Jr., the 4th District incumbent, who already had drawn the third ballot spot for the primary, gave a mirthful shake of his head while leaving the courtroom. “What a spectacle,” he sighed.